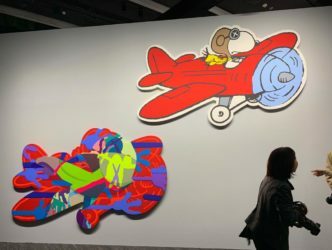 “The first time someone stole a piece of art from me it was a work by Kaws, two small paintings from my gallery in Miami ten years ago,” says Emmanuel Perrotin, the French gallerist with branches in Paris, New York and Asia. “I like cultural phenomena,” the dealer explains with regards to the American artist born in 1974, whose real name is Brian Donnelly and whose recent large-scale sculptures are being sold for up to a million dollars. 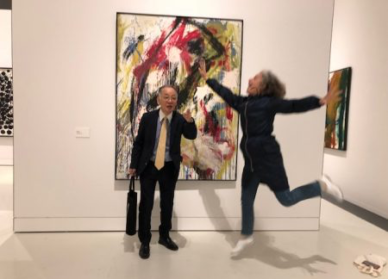 However, on April 1, much to everyone’s surprise, a relatively small painting (101 x 101cm) by the former street artist was sold at auction by Sotheby’s to an Asian buyer for 14.8 million dollars (Rumour has it that there has been a purchase by Raphael Geismar owner of the Bibo restaurant in Hong Kong among other things.Kaws previous record was 3.4 million dollars). 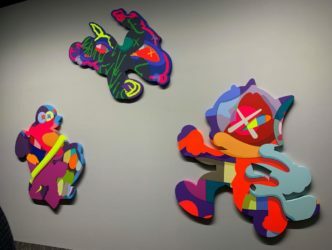 Up until then Kaws had occupied a hybrid category, a kind of Pop Art or street art for advocates of a new “cool” culture, keen to look out for the cartoonish characters that populate his universe with their distinctive crossed-out eyes. In this case, the little painting had been commissioned from Kaws in 2005 by a famous Japanese designer, Nigo. Its aesthetic refers to a Beatles album, Sgt. 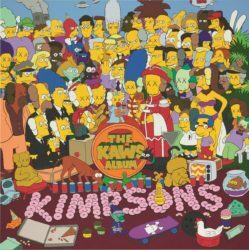 Pepper’s Lonely Hearts Club Band, but also takes characters from the cartoon The Simpsons, who under his pencil and sporting the famous crosses for eyes have been rechristened The Kimpsons. It’s a known fact that auction houses, driven by good business sense, tend to be quick to compliment. This is not the case for one of the most prominent art historians and exhibition curators on the planet. The Milan-based Germano Celant (born in 1940), who has curated numerous exhibitions for the remarkable Fondazione Prada, is the theoretician for the Italian Arte Povera movement, one of the great champions of the American minimalist art movement, and was also acquainted with major twentieth-century figures like Andy Warhol and Robert Mapplethorpe during their lifetimes. But the same Celant is curating an exhibition staged at the HOCA foundation in Hong Kong until 14 April featuring 37 pieces by the American artist, created over the past ten years (1). 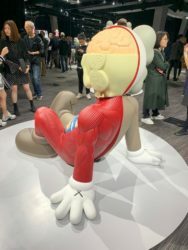 (During the Art Basel Hong Kong fair a giant inflatable figurine by Kaws measuring 37 metres in length was also floating in Victoria Harbour). 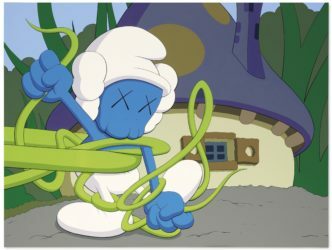 Through taking up the position of curator of the exhibition “Kaws: Along the way”, Celant is lending his credentials to a creation that might seem marginal to many in the global artistic and critical circles. “He represents a new generation of artists who are following in the footsteps of Warhol,” explains the historian. “He’s indifferent to traditional distinctions. He practices appropriation and is fond of the principle of the multiple. He infiltrates his images using any means. At the same time, his iconography is melancholic. To depict closed eyes is to depict death. 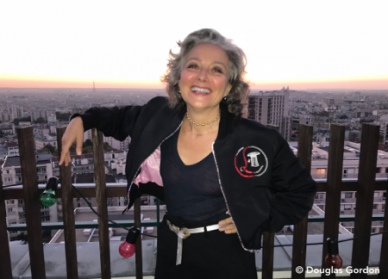 I’m sorry to all those who are pro tradition, but culture is no longer to be found only in painting but also on shoes, t-shirts, dolls… Keith Haring opened a shop in his day, too. The opening of the exhibition in Hong Kong was crazy. 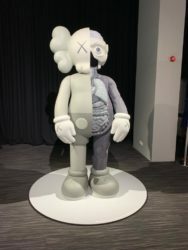 Kaws was treated like a rock star,” concludes Germano Celant, who will also be curating an exhibition opening on 24 October this year at the Fire Station, a public museum in Doha in Qatar. 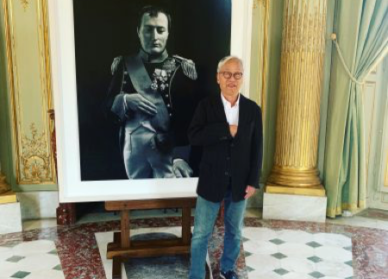 In the art trade it’s common knowledge that Jose Mugrabi, the “professional collector” known for being the owner of the largest number of Andy Warhol works in the world, has for a long time been a massive buyer of Kaws. For a while now it’s been the Per Skarstedt gallery based in New York and London – renowned for championing artists as important as the German painter Martin Kippenberger – who has represented Kaws in the United States and in England. He explains to us via email: “I think he is a great artist, who has a great understanding of the relationship between popular culture and art history, he is a brilliant colorist, and an artist who can deal with large-scale sculptures in a very impressive way,” . 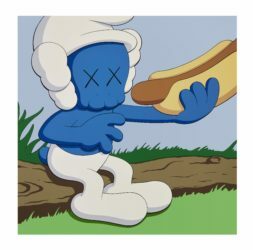 Skarstedt is selling Kaws’s new artworks for between 80 and 450,000 dollars. But these days there’s another famous curator and writer, the former director of the Venice Biennale Francesco Bonami, who vigorously opposes Kaws’s commercial success. “He produces these kind of toys, not art. He also doesn’t represent the new generations, who are far more sophisticated. He cannot be described strictly speaking as an artist, but rather like they used to say in the past as a ‘commercial artist.’ It’s wrong to compare him to Andy Warhol, whose universe was far vaster. He is the reflection of a society attracted to imagery of mediocre quality. 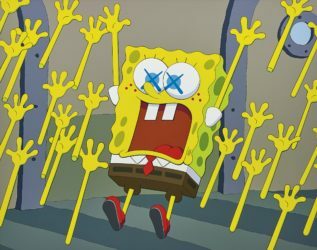 All these new Kaws supporters, who until now had an excellent reputation, are in the process of destroying the art market. They are in no way encouraging the intellectual effort required to understand the universe of artists,” explains Francesco Bonami. 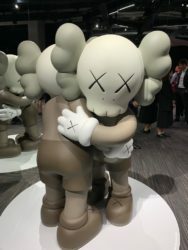 According to the Artprice database in 2018 there were 409 works by Kaws sold at auction for an average sum of 76,000 dollars. But it’s clear that nowadays the most expensive pieces are increasingly appearing on the secondary market (the market for artworks that don’t come straight from the artist’s studio). At Sotheby’s in New York, Grégoire Billault observes that the rise in his prices dates from a little over a year ago, adding that “while his works may raise a smile with one section of the art intelligentsia, it’s clear that major collectors also possess his work.” Moreover, the flagship evening sales of contemporary art in New York this May will be featuring lots from Kaws for the first time. Sotheby’s and Christie’s will respectively put on sale on 15 May and 16 May paintings from 2008 and 2009 that adopt the aesthetic of the Smurfs, estimated at 1.5 million and 600,000 dollars. Phillips will also have a painting on sale from 2012 on 16 May estimated 600 000 dollars. Is this surge in demand an epiphenomenon? The real question will be to find out which of the world’s major institutions will now be prepared to exhibit the former street artist.